Seneca was a famous Playwright from Rome, who lived between 4 BC and 65 AC. 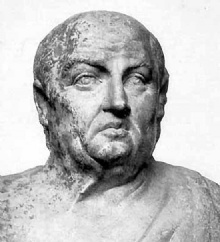 Lucius Annaeus Seneca (often known simply as Seneca, or Seneca the Younger) was a Roman playwright, and in a work humorist, philosopher and politician, son of Seneca the Elder and his older brother Gallio. Seneca was a short time tutor to the Emperor Nero. Later the Emperor suspected him of conspiracy and forced him to take his own life when he was involved in the Piso conspiracy to assassinate the emperor, but it is possible that Seneca was innocent. Our collection contains 9 quotes who is written / told by Seneca, under the main topic Words of Wisdom. "No man was ever wise by chance"
"Drunkenness is nothing but voluntary madness"
"Friendship always benefits; love sometimes injures"
"We never reflect how pleasant it is to ask for nothing"
"Just as I shall select my ship when I am about to go on a voyage, or my house when I propose to take a residence, so I shall choose my death when I am about to depart from life"
"Enjoy present pleasures in such a way as not to injure future ones"
"Begin at once to live, and count each separate day as a separate life"
"While we teach, we learn"